August 23, 2011 was Anne-Sophie Mutter's 35th anniversary of concert performances (in 1976 she first appeared on stage at the Lucerne Festival, playing Mozart’s D major Violin Concerto) – to celebrate this remarkable milestone Deutsche Grammophon is fêting her with a limited-edition, numbered, deluxe box-set of 40 CDs comprising of her entire DG discography (and more) from 1978 to 2010 – availability beginning on 26 August 2011. 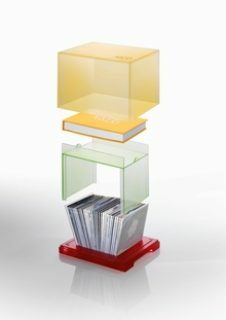 This special box-set is unique – it is a stunning, multi-coloured, multi-layered, collectible piece – made of transparent, frosted acrylic, including a 300-page hardcover book with interviews, reminiscences, and many photographs. Simultaneously Deutsche Grammophon is releasing Anne-Sophie Mutter's new album of four world-premiere recordings: Wolfgang Rihm's Lichtes Spiel and Sebastian Currier’s Time Machines have been recorded with the New York Philharmonic under conductors Michael Francis and Alan Gilbert, respectively. In addition, Roman Patkoló, one of the most talented pupils from the Anne-Sophie Mutter Circle of Friends Foundation, is Anne-Sophie Mutter's partner in the premiere recordings of Rihm's Dyade and Krzysztof Penderecki's Duo concertante. The 40-CD box set contains all of her Deutsche Grammophon recordings from her debut Mozart Concertos (1978) to her Brahms Sonatas (2010) – all with their original cover-art in mini-LP sleeves. The set includes more than 40 hours of music: all of her Karajan recordings (1978–1988); her best-selling Carmen Fantasy CD; her four Grammy®-award winning recordings, including the complete Beethoven Violin Sonatas; her magisterial survey of Mozart’s Concertos, Sonatas, and Piano Trios from 2006; contemporary compositions dedicated to her by Henri Dutilleux, Sofia Gubaidulina, Witold Lutosławski, Norbert Moret, Krzysztof Penderecki, André Previn, and Wolfgang Rihm, and more. There are two bonus CDs of rare and previously unreleased recordings: the Lutosławski Memorial Concert in Warsaw (1994); a chamber recital with Lambert Orkis (1995); and the 11-year-old Anne-Sophie playing solo Prokofiev (1974). 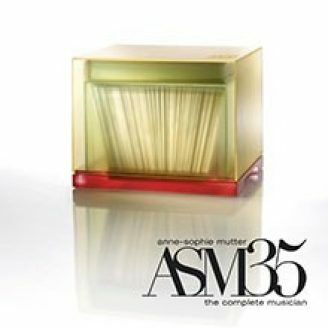 Given its prestigious character, this limited edition of 6,500 copies are numbered – and Anne-Sophie Mutter has autographed the first 400 (numbered) books. Box-set No. 0001 will be auctioned on eBay – the auction begins 29 September, lasting one week – all proceeds will go to a charity of Anne-Sophie Mutter's choice. Also to be released simultaneously with the deluxe box-set and her new album is a 2-CD anthology of Anne-Sophie’s recordings, “highlights” – a whirlwind survey of her recording career.